A picture of the newfound blue-tinted superluminous supernova PTF 12dam. The cause of a mysterious, long-lasting, superbright form of supernova, the most energetic stellar explosion in the universe, may now have been discovered, astronomers say. Surprisingly, these outbursts may be driven by the birth of magnetars, dead stars that rank among the most powerful magnets in the cosmos, according to a study published online today (Oct. 16) in the journal Nature. More than a decade ago, scientists first detected a new, extremely rare class of supernova. These incredibly bright explosions, known as superluminous supernovas, are up to 100 times brighter than other types of stellar outbursts. A number of these explosions fade very slowly, matching theoretical models of what are called pair-instability supernovas. Astrophysicists suspected that within the extremely massive stars thought to give rise to pair-instability supernovas — ones more than 140 times the mass of the sun — conditions are just right for gamma-rays, the highest-energy form of light, to convert into pairs of electrons and their antimatter counterparts, known as positrons. These gamma-rays normally exert pressure that helps support the star against the crushing effects of its own gravity. However, as gamma-rays get converted to matter, the star loses this support and collapses in on itself. This, in turn, causes a runaway explosion that completely obliterates the star. Scientists had suggested these slow-fading explosions generate huge amounts of radioactive matter, enough to equal several times the mass of the sun. This debris produces superluminous supernovas' slowly dimming light through radioactive decay, according to the idea. Now, however, researchers have discovered two superluminous supernovas whose slow-fading light was apparently not generated by radioactive decay. Instead, these supernovas may be caused by a type of explosion that creates extremely magnetic neutron stars known as magnetars. 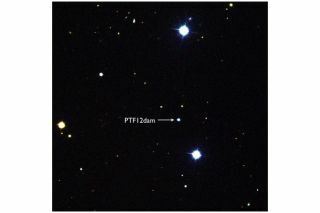 Astronomers discovered two superluminous supernovas named PTF 12dam and PS1-11ap, which lie about 1.6 billion light-years and nearly 10 billion light-years from Earth, respectively. The light from these explosions was blue in color and increased rapidly to their peaks over the course of about two months, whereas pair-instability supernovas should be redder and increase more slowly. Computer models suggest explosions that create magnetars could generate the light patterns seen from these newfound supernovas. Magnetars are a kind of neutron star, remnants of dead stars that are only about as large as a city but contain at least as much mass as the sun. Magnetars possess magnetic fields up to 5,000 trillion times more powerful than that of the Earth. Magnetars that expel glowing matter in vast amounts more than 10 to 16 times the mass of the sun during their births could explain these newfound supernovas, researchers said. "It was exciting to find such a great match to the predictions of the magnetar model, which also fits most of the fast-declining superluminous supernovas," study lead author Matt Nicholl, an astronomer at Queen's University Belfast in Northern Ireland, told SPACE.com. "Two types of supernova which previously looked very different can actually both be explained quite nicely by this model." The brightness and colors of PTF 12dam and PS1-11ap are similar to another recently observed superluminous supernova, SN 2007bi, originally suggested to be a pair-instability explosion. This suggests that pair-instability explosions may be even rarer than before thought, accounting for less than one out every 100,000 supernovas. SN 2007bi was only thought to be one of a handful of pair-instability supernovas. These new findings could banish pair-instability supernovas back to the realm of theoretical possibility, although they do not rule them out, Nicholl said.